Who’s been watching Series 3 of the Great British Sewing Bee then? Wasn’t last nights episode great? 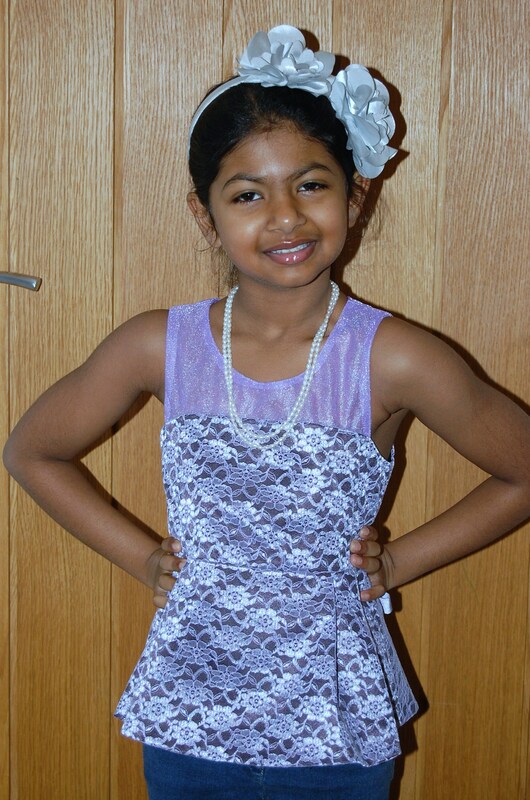 Without giving too much away, the theme for the week was “sewing with challenging fabrics”, one of them being lace. The lace featured in todays post wasn’t sewn up by any of the contestants (I don’t think), but I think I did spot it for a few seconds being handled by Debra? Anyway, this lace is a very reasonably priced corded lace fabric in lilac, from White Tree Fabrics. White Tree Fabrics asked if I would make something up in this fabric to compliment their laces being featured on the program and I was happy to do so. The pattern I have used is McCalls 6829 which is sadly now discontinued (although some sites still appear to be selling it). This is one of the Fashion Star patterns, and although, personally I don’t think the envelope photographs do it much favour, it is lovely when made up. I made view B, but basically decided Kezia has too many party dresses, and a top might be more practical. So I cut the skirt off at 8 inches to make a peplum top. I cut a size 7, but ended up removing a total of about 3 inches from the side seams. 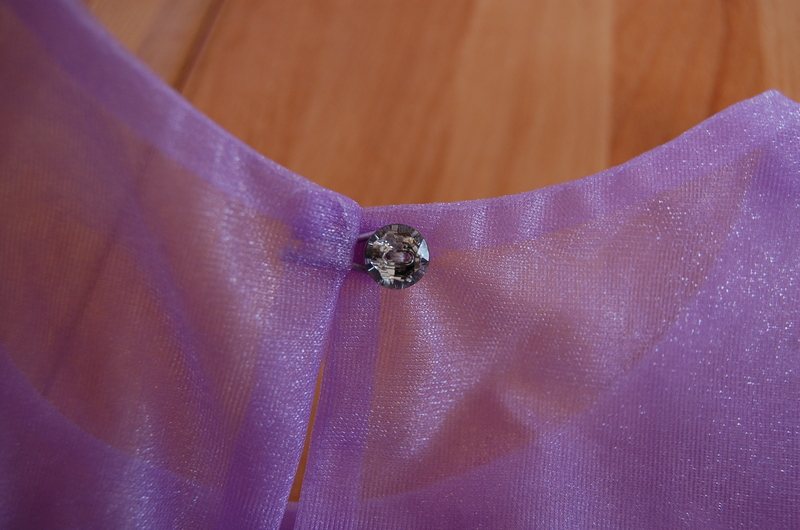 This top is fully underlined (except the yokes) and lined using this aubergine light weight satin (currently reduced to 50% of the original price!) The yokes were cut from this lilac shimmer mesh. I added a sparkly button from my button jar. 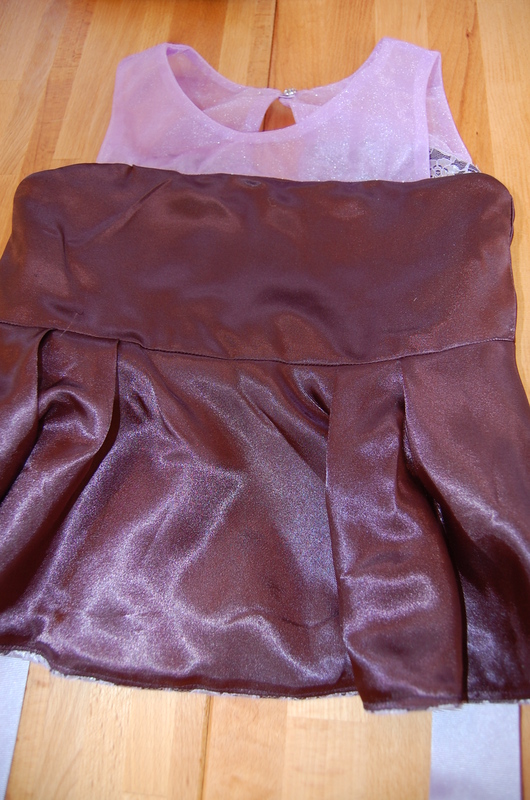 The fabrics were easy to cut and work with, although I did use a microtex needle to sew through the satin. I made a slightly modified version of View B. Yes, except I made a peplum top rather than a dress. Nothing to dislike. I love the finished product. A corded polyester lace, a shimmer mesh for the yokes and a lightweight satin to underline and line. 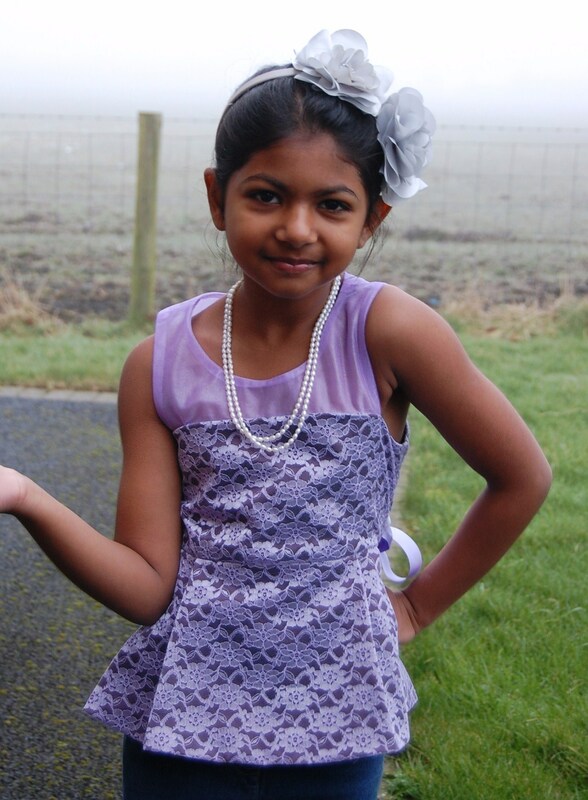 All fabrics were supplied by White Tree Fabrics as a promotion to tie in with this lace being featured on series 3 of the Great British Sewing Bee. Yes! I think this is such a cute top and I could definitely see me making this again in fun cottons for the summer. Yes, if you can get this pattern (it’s now discontinued), I would recommend. It is perhaps a little bit of an older look, but made in cottons I think it will be very cute. My daughter’s very pleased with this. It’s perfect to dress up jeans or leggings but still practical to let her play rough and tumble at parties. very pretty and she is looking so grown up! SOoo adorable!!!! And I love her little pearls!!! Thanks Kathy. 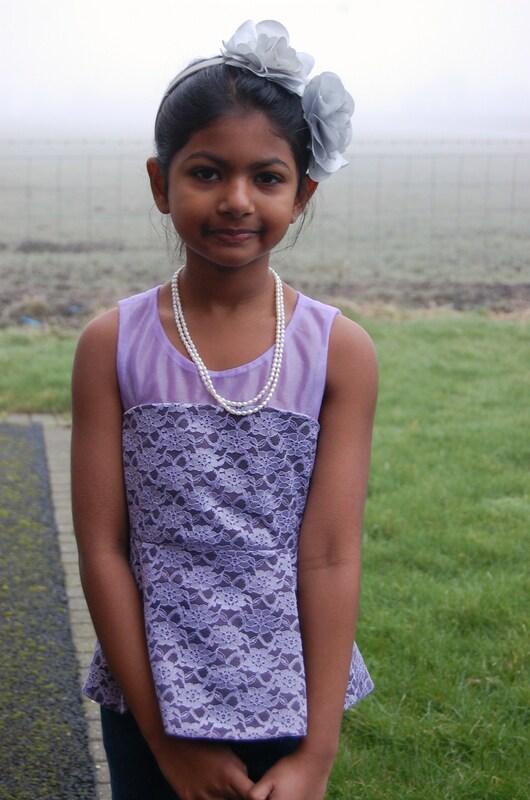 The pearls were a gift from my aunt and I got them strung in India. Kezia looks very girlie and lovely in her new top. This is an excellent example of why we sew, it beautiful. Only one word…beautiful…both your daughter and the top! Wow, she’s growing up fast and beautiful! I love, love, love that top! !